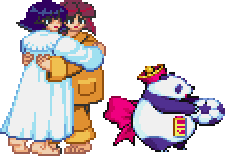 Hsien-Ko and Mei-Ling were twins born in a family of Senjutsushi's. Both of them were raised to be Senjutsushi's and were taught Senjutsu. On the ceremonial night when they were to become a Senjutsushi, their village was attacked by Darkstalkers. The mother of the twin girls gave her life to protect the sisters. But because of this, the mother's soul was trapped in darkness. To release their mother's soul from the darkness, Hsien-Ko uses the Igyo Tenshin no Jutsu to turn into a Jiang Shi. Mei-Ling, her older sister, turns into a ward to make sure Hsien-Ko doesn't lose control of herself. The two set of to hunt down Darkstalkers as a Darkhunter of the night. After the two had freed their mother's soul from the darkness, the two were reincarnated with the powers of their mother. The two were reborn in a normal family and were raised in happiness. On their 16th birthday, the two sisters had awoke to their powers. These powers had been passed down from the very first member of the Shao family. This was their mother's way of repaying her daughter's for her soul. But because the two of them awoke to their powers, Jedah sensed this power and deemed them as worthy souls. The two dreamed again on the night their powers awoke. It was a nightmare which was caused by Jedah's summoning. Their souls were instantly transferred to Majigen. This place was where the Senjutsushi's and the Darkstalkers battled. It was a legendary land and Hsien-Ko and Mei-Ling's homeland. Their leftover bodies had no soul in them anymore. They lied their side by side with no sign of life. The two of them have no memory of their previous battle. They do not know why they are in Majigen. But they both feel strongly that they must win the battle to return to the real world. To them, it is a weird feeling, like watching a bad nightmare. Their form in Majigen is the form which is best suited for battle. The same form they took when Pyron came to Earth. This is due to their mother lending them some powers. Though the two of them had experience as Darkhunters, they were now just ordinary girls. To survive in the world where demons live, they needed their powers of Senjutsu. With help from their mother, they could use various arts without any thought. However, the moment the two sisters lost trust in each other, their powers would be lost instantly. After the events of Vampire Savior, the two sisters go back to the human world and go back to their normal lives again. When hit by Anakaris' Pharaoh's Curse, she becomes a small panda kicking a soccer ball around. When attacked by Demitri's Midnight Bliss, both Hsien-Ko and Mei-Ling transform back to their original young selves in pajamas, clinging to one another in fear. Hsien-Ko is known as Lei Lei in Japan, and her sister is known as Lin Lin. 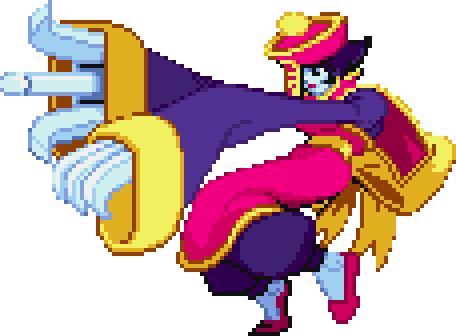 Hsien-Ko holds a surprising number of objects in her sleeves, which she throws at her opponents throughout the battle, including knives, axes, boomerangs, and on rare occassions, a little statue of Akuma from Street Fighter II. Mei-Ling is the elder twin sister of Hsien-Ko. In order to aid her sister in battle, she transforms herself into a talisman, and attaches herself to Hsien-Ko's cap. Without the presence of this talisman, Hsien-Ko's powers would grow beyond Hsien-Ko's ability to control, and she would rampage with no ability to stop herself. During Hsien-Ko's Vampire Savior Dark Force, Mei-Ling appears in human form, allowing some of Hsien-Ko's power to flow at full strength for a limited time. During this time, all of the damage that Hsien-Ko inflicts can not be recovered. Mei-Ling makes a appearance as one of Anita's summons in Marvel Super Heroes. She also makes a brief appearance in the ending of Super Puzzle Fighter II Turbo, where she can be selected in talisman form as a secret character. She also appears as a downloadable alternate skin for her sister in Ultimate Marvel vs. Capcom 3. This page was last edited on 20 February 2018, at 02:33. This page has been accessed 36,621 times.